Summer break is almost here! I know this because my boys have been counting down the days since Christmas. Summer is great, but I never understood why they call it the “lazy days of summer.” Yes, there are summer vacations, but summer can also be very busy with activities, even more so than the winter. Can I get an amen?! You know what else gets busier during the summer? The sidewalks and streets. Kids are out and about heading to the park, the pool, or a friends house to play. It got me thinking about making people more aware on my street. There are some who fly down my road, never giving a thought to a child who forgets to look both ways before crossing the street. Bottom line – people need to be aware, but sometimes they just aren’t. So, I decided to make my own Child Safety Caution Sign to put in my yard or better yet, the middle of the street when kids are playing outside. It will help people slow down and possibly even think about it a little more when they are driving elsewhere. Yes, kids need to be responsible and look both ways when entering a street as well. Putting out a sign like this, does not mean that the street is an open playground and they no longer need to be aware. I feel putting a sign out just helps the situation. Teaching kids safety rules and reminding drivers to slow down is a good mix to me! 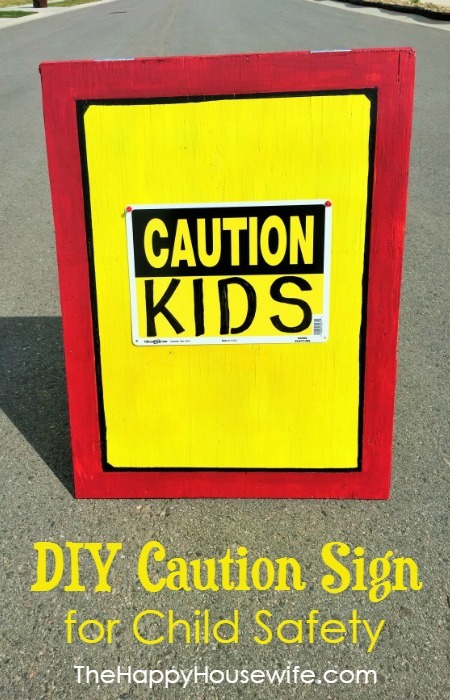 You can buy child safety signs at a lot of places, but…you can also make your own, for half the price! The wood I used for my sign was just an old piece of plywood we had. It is nothing pretty, but after slapping some paint on, it began to come around. And getting my kids involved while making it was a great way to start talking about safety. So saddle up and lets make a Safety Sign! 1. Cut the plywood in half, so the size of each piece is 24 x 32. 2. Prime each piece or plywood on both sides and let dry. 3. Spray paint each piece with neon yellow. You can do both sides or leave the back white. The outside needs at least 3 coats to get good coverage. Allow to dry. 4. Use the measuring square to outline the space for the red border. Use a pencil to make your lines. 5. 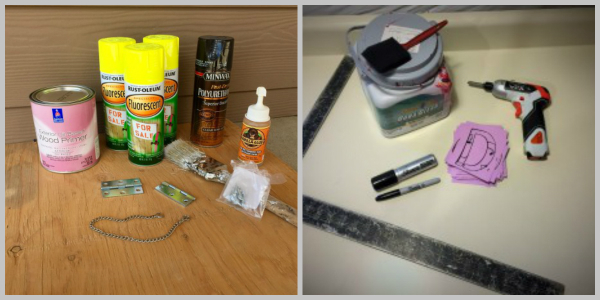 Use the foam brush to paint the red boarder. You will need 2 or 3 coats here as well. Allow to dry. 6. 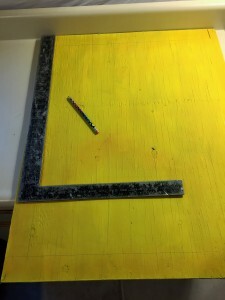 Use the measuring square to outline the border with a black Sharpie. I used the big thick Sharpie to do this. Allow the lines to dry. 7. Use the paint brush to apply the polyurethane. You can also use spray polyurethane. I did 2 coats. Allow to dry. 8. 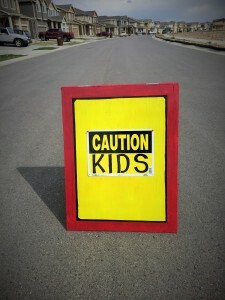 While poly is drying, stencil “KIDS” on your caution signs. I did not have enough room to write children, or at least enough room to write children in bold enough letters for drivers to see, so I went with kids. 9. Attach the hinges to connect the two pieces of plywood. 10. 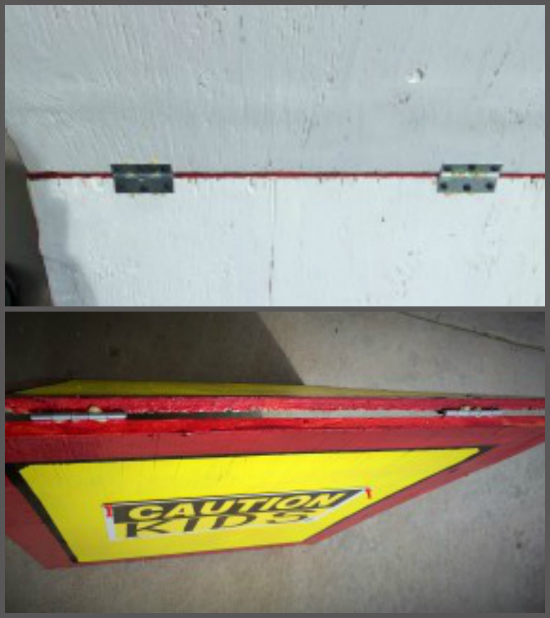 Attach the caution signs with tacks. You can also use short nails if you have them, but the tacks worked great. 11. If you want, attach the chain underneath and between the two pieces so they do not fold out. You have made your very own children safety sign! It wasn’t that bad, was it? And, you are helping make drivers more aware. But again, putting this sign out does not mean that kids should feel comfortable to just run free without practicing safety. They still need to be aware. Please remember when you are driving through a neighborhood, to slow down and be aware yourself. Taking just a few extra precautions can really make a difference and help prevent accidents. This is such a great idea, I think too many people forget they are in a neighborhood with kids playing. Thanks for the tip.